Scientists Discover A Scorched Planet With A Comet-Like Tail : The Two-Way The planet called KELT-9b is around three times more massive than Jupiter. It orbits a blue star about 650 light-years away from Earth that's nearly twice as hot as our own sun. 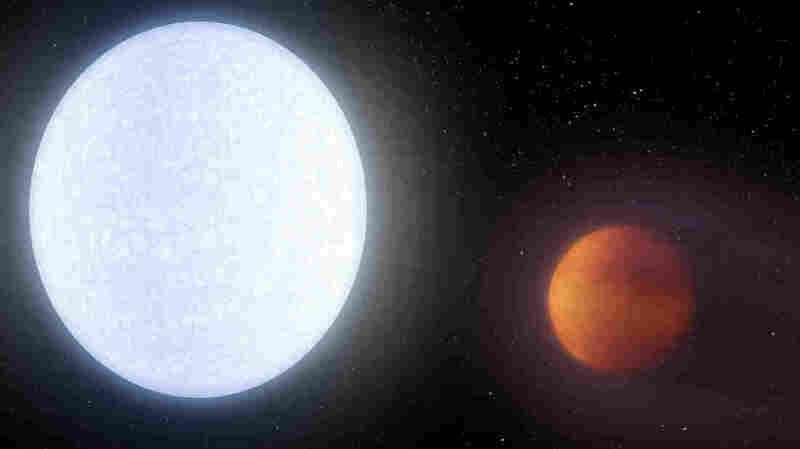 An artist's conception of the KELT-9 system, which has a host star (left) that's almost twice as hot as our sun. The hot star blasts its nearby planet KELT-9b, leading to a dayside surface temperature of around 7,800 degrees Fahrenheit.